Though water is a crucial part of plant life, not all plants thrive with an excess of water. Too much rain or overwatering can lead to root rot in many plants, causing them to wilt and droop, or even die. Luckily for gardeners who live in rainy regions or who have a constantly wet section of their garden, many flowers can soak up a lot of water and produce healthy blooms. Tall growing and elegant, Gladiolus (Gladiolus x hortulanus) is a spring-flowering perennial that is often grown as a flower for bouquets. The plant boasts flower spikes covered with flashy blooms in shades ranging from bright red to pale lavender and yellow, depending on cultivar. The plant, which can reach 24 to 48 inches tall, grows well in soils that are moist or wet. The plant is adaptable to both clay soils and sandy loams, and it needs full sunlight. 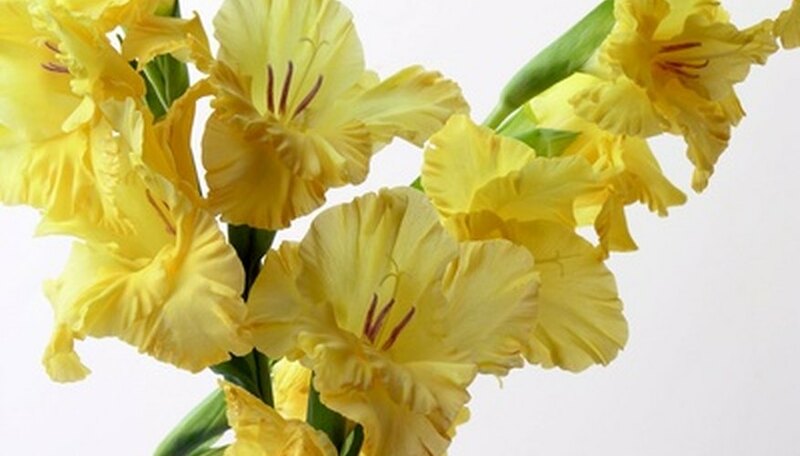 Gladiolus grows in USDA Hardiness Zones 3 to 11a. Native to North America, swamp azalea (Rhododendron viscosum) is a flowering shrub that produces large flashy pink and white blooms in the spring. The plant will grow in moist or even wet soils, preferring soil that is acidic and loamy. Swamp azalea is commonly used both as an ornamental and to bring wildlife to the garden; the blooms attract birds and butterflies. Swamp azalea grows best in partial shade in zones 4b to 8b. A native of tropical Asia, mahoe (Hibiscus tiliaceus) is an evergreen shrub that boasts leathery, deep green foliage and funnel-shaped hibiscus blooms that change from yellow to red over the course of a day. Also referred to as sea hibiscus, mahoe is ideal for coastal locations, and it grows in zones 10 and 11. Mahoe has good salt tolerance and loves to be watered frequently. Mahoe grows best in full sun in well drained, even somewhat sandy, soils. The shrub can reach 25 feet tall and nearly as wide.